Tony Roberts of Archeoscan brought members up-to-date with his recent excavations on two sites in South Gloucestershire. Both sites have been ongoing for a number of years and have been excavated by volunteers from members of the public. The first site is Doynton villa, a subject on which Tony has presented to the Society previously. This talk outlined the last two seasons when the focus was on a couple of rooms to the East of the building complex. These interventions established that this was the rear of the main building and both rooms were relatively austere and industrial in nature. The 2015 season revealed a relatively small room approximately 5m x 6m with many of the walls robbed out and partial interiors of other cells. The wall masonry was better preserved to the East of the trench. Apart from the usual high volumes of Roman domestic material a splendid complete 4th century flask was recovered from a pit under the floor level in the corner of the room. This was probably laid as a good luck offering and reflected the placement of sheep skulls that were discovered in a similar context in an opposite corner of the same room in a previous season. Of particular note in this trench was the higher volume of lower denomination coins that were recovered. The 2016 dig continued to the East of the complex and uncovered smaller rooms that displayed evidence of industrial activity. Iron working evidence was clear in one area with tap slag still close to a small smelting pit. Along with the almost total robbing of the wall masonry, the most notable feature was the construction of the Eastern-most room over a previous ditch line. Throughout the dig this ditch was wet as the water table was relatively shallow. However, the placement of the building over the ditch was deliberate as a crude stone-lined ‘well’ had been sunk into the ditch area to exploit the water. There was evidence of clay being used to stabilise the Eastern wall and to build up floor levels in this area where some subsidence had occurred due to the presence of the ditch. There was probably an association with the metalworking close by. Tony acknowledged the generous financial contribution made by BAAS towards the finds analysis on this site. Tony also updated the meeting on the Roman site at Hanging Hill near Upton Cheyney. A geophysical survey and small evaluation in 2012 (reported in a previous edition of BAAS) was followed in 2015 by a more extensive excavation on a terrace. 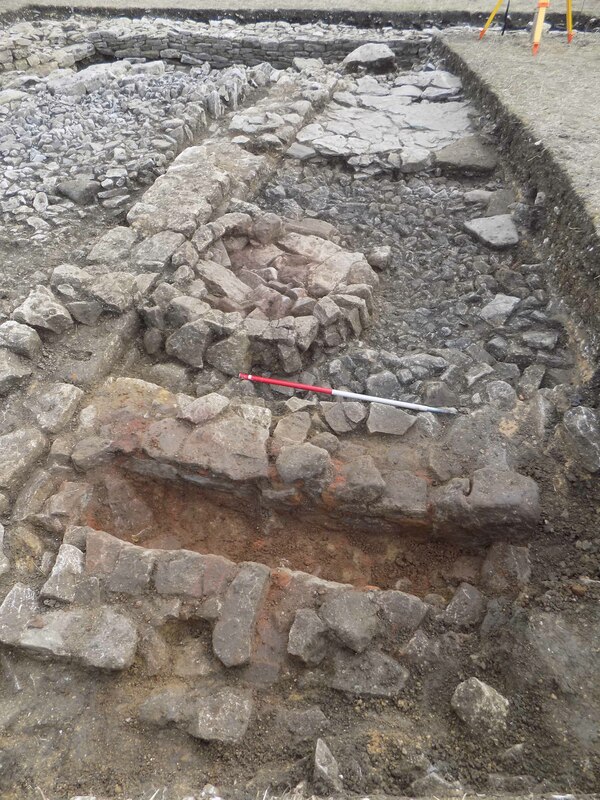 This uncovered the remains of an outbuilding with associated ovens dating from the 2nd to 4th century. Fragments of painted wall plaster and high status pottery hinted at a larger complex on the hillside. This year the dig focussed on the same terrace but further to the East and uncovered a significant boundary wall measuring up to 1.8m in width. This enclosed a well-preserved stone building that showed signs of agricultural use with associated oven, corn-dryer and possible threshing floor although only a small area of this building was uncovered. 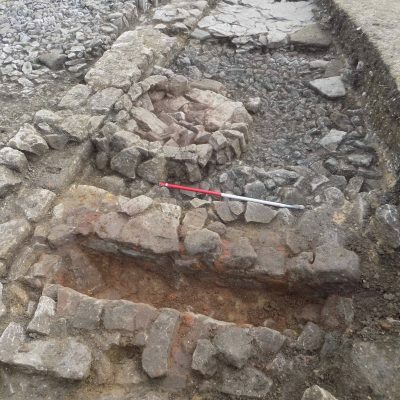 The boundary wall appears to project to enclose the building and ovens discovered last year hinting at a larger complex of buildings in this location. It is unclear whether the stone building is the main domestic accommodation on the site and establishing this will be the focus of subsequent digs on the site. The recovery of a proportionately large number of bone hairpins from this site sets a puzzle about its use that will need to be resolved. 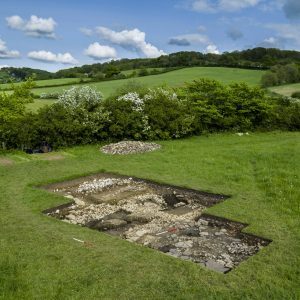 The landscape setting of this site suggests a larger complex in the junction of old roads to Bath alongside which other Roman remains have already been uncovered. Excavations on both sites will continue in 2017.